Joel Edgerton's latest revels in good old-fashioned long-standing childhood resentments that boil over into uncontrollable rage. 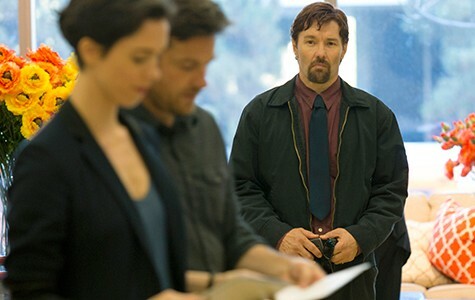 Jason Bateman stars in The Gift. Written and directed by Joel Edgerton. With Jason Bateman and Edgerton. Opens Friday. 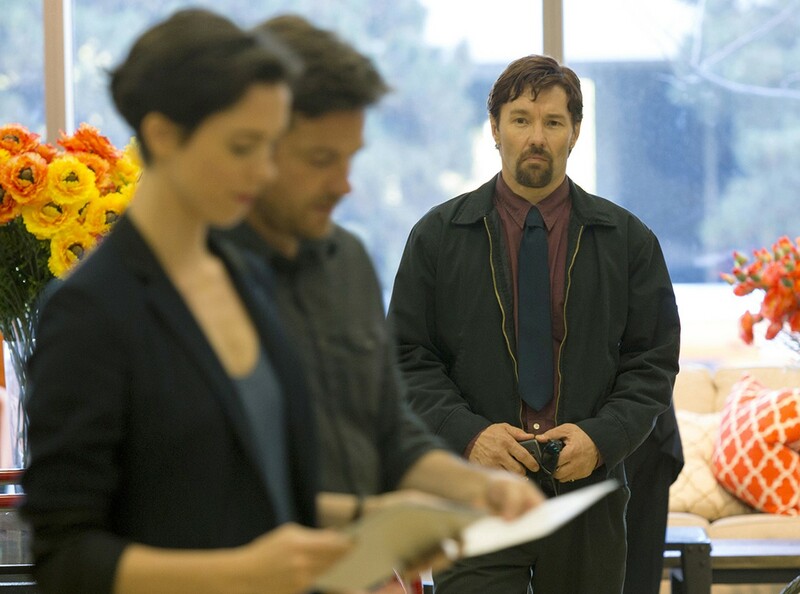 In the opening scenes of The Gift, Simon (Jason Bateman) and his wife Robyn (Rebecca Hall) are in the process of moving into their new house when they are approached in a store by Gordo, a vaguely remembered "old school friend" of Simon's. Awkward introductions are made. He seems a bit strange, but they're excited and busy and let it go at that. However, a few minutes later back at the house they're surprised to find Gordo (played by the movie's writer-director, Joel Edgerton) at the front door with an embarrassing over-abundance of house-warming presents. It's at this point that we become aware of something ominous about the newly acquired home, an elegant mid-century modern. It appears to be tailor-made for the upwardly mobile couple, a stylish setting to entertain Simon's business colleagues, and perhaps, a fine place to raise children. But the glass walls offer no privacy, especially at night. The house is a perfect target for window-peeping. Gordo and his creepy abruptness prompt our fears. As the story progresses, he has a habit of popping up unexpectedly on the other side of the glass, usually when Simon is away at work and the nervous Robyn is home alone. He seems to be stalking them, but Simon doesn't want to talk about it. The stage is set for a rousing three-character melodrama, bristling with plot turns and disturbing revelations. Australian international filmmaker Edgerton is a practiced hand at stressful scenarios. He and his stuntman-writer-producer brother Nash Edgerton have lent their talents to a slew of action-packed Oz thrillers, including The Square, Felony, The Rover, Wish You Were Here, and Animal Kingdom. Armed with rugged good looks and an omnipresent air of repressed menace, Joel Edgerton's acting forays into Hollywood in Warrior, The Thing, Zero Dark Thirty, and The Great Gatsby mark him as a durable, roughhouse portrayer of characters. But on the evidence of the two brothers' short The Spider (co-directed by David Michôd) there's nothing like full-strength Edgerton to make your hair stand on end. Gordo bears a serious grudge against Simon, but keeps it at a low simmer for maximum suspense. Edgerton hasn't portrayed many characters this smothered, and the more Gordo stammers and shuffles, the more violent retribution we anticipate. As the screenplay carefully peels away the layers of Gordo and Simon's relationship, we observe how Simon deals with the world. He's a self-centered, hyper-ambitious sales rep in a large corporation, willing to do anything to succeed, including keeping his anxious trophy spouse on tenterhooks. Former child actor Bateman, usually cast as untrustworthy smoothies in light comic fare, gets put through a workout as guilty hubby Simon — it could be the biggest stretch he's ever made. Meanwhile, with her mournful face and built-in apprehensiveness, Hall's Robyn assumes the pivotal role in the glass house, a wounded bird in a crystal cage. She overacts, but only slightly. The role of tenderhearted wronged wife suits her talents, especially in Robyn's scenes with Gordo — it is Robyn who sympathizes with him, over Simon's protestations. Every psycho thriller requires at least one character for the audience to identify with, even if she overdoes the fainting spells. Kudos to Julian Slater for his sound editing, always important in a pic with peek-a-boo assailants. And thanks to Edgerton for pointing out, in a Q&A following the press screening, his directorial prank of paying homage to Rodney Ascher's cult documentary Room 237 (a geek-o-rama examination of Kubrick's The Shining) by putting that number on every office door in the movie. No snowy garden mazes or crazed writing-block sufferers in The Gift, just good old-fashioned long-standing childhood resentments boiling over into uncontrollable rage. Joel Edgerton is a legitimate triple threat.